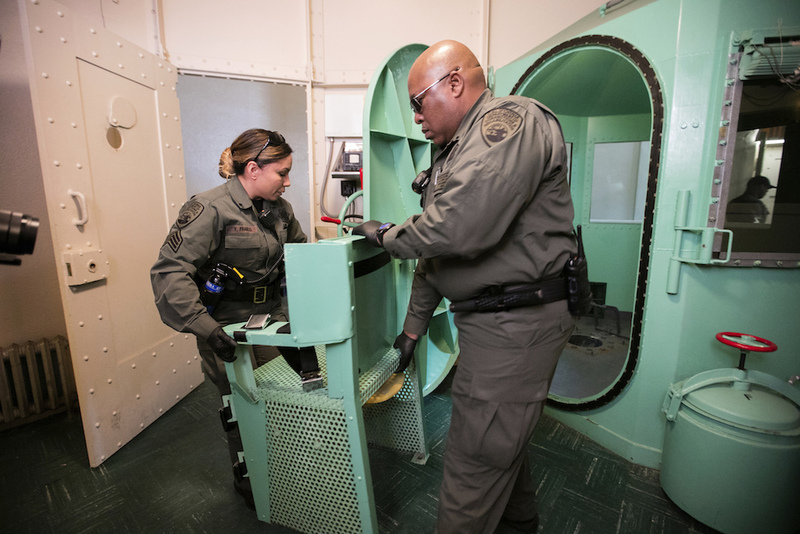 After Governor Gavin Newsom signed an executive order placing a moratorium on the death penalty on March 13, 2019, employees at San Quentin State Prison began dismantling the death penalty chamber. Courtesy of California Department of Corrections and Rehabilitation/Associated Press. The death penalty in California is dead! Long live the death penalty! That lede isn’t a joke. It isn’t even a contradiction. In California, the death penalty has long existed simultaneously as a grave moral problem and a necessary tool. So, if Governor Gavin Newsom’s new moratorium on the death penalty becomes a permanent ban, we Californians should celebrate the end of a policy that magnified our society’s worst disparities, put us at odds with so many other countries, and created the risk of putting an innocent person to death. But we—and I mean all of us, including death penalty proponents and opponents—also might pause to reflect upon and even mourn the demise of this miserable practice. For the death penalty has provided an essential public service—shining a bright light into the darkness of California’s prison system—that we may miss once it’s gone. Let’s start with a stipulation: Since its revival in California in 1978, the death penalty has never really been about killing large numbers of people. Californians have executed 13 people in the past 40 years. More Californians than that die in traffic accidents over a holiday weekend. California’s death penalty was, at its heart, a political and moral stance, a way of expressing frustration at violent crime, a desire to be tough with criminals, and a commitment to supporting crime victims and their families. The death penalty also was an enormous headache for the criminal justice system, since capital cases consumed legal resources, slowed the courts with endless appeals, and drew media scrutiny. These costs, both in money and reputation, are why so many within that system have long wanted to do away with the death penalty. But these same costs are also why the death penalty had real value for the state. California’s prison system has long been an embarrassment because it exists in the dark. The prison walls keep the public and even our elected representatives from understanding too much about what goes on there. And the system’s default condition is scandal. A powerful prison guards’ union effectively runs the show, soaking up billions in state dollars for their compensation, money that should go to higher education or infrastructure. For decades, the system was unconstitutionally overcrowded, with health care that failed to meet basic standards. The state refused to fix these problems until the federal courts intervened. In this context, the death penalty was vital because it provided one of the few sources of accountability, and attention, for the prison system. Californians may have been okay with locking up people with life sentences and forgetting all about them, but death penalty cases could not so easily be ignored. The media is more likely to cover death penalty trials and appeals—given the dramatic stakes—and that provides the public with a glimpse of the social failures that produce the worst violent crimes. Celebrities love to bring their glamor to opposing the death penalty; you could cast 10 Oscar-winning films with just the actors advocating on behalf of Kevin Cooper, the most high-profile death penalty case in the state right now. And there may be no more star-studded event in California each year than the Beverly Hills gala for Death Penalty Focus, the anti-death penalty group associated with M.A.S.H actor Mike Farrell. The death penalty also commands official attention. Governors can’t avoid reckoning with death penalty cases. Some of the state’s best attorneys work on death penalty appeals, many pro bono. And if you ever want to hear justices of the California Supreme Court whine, just ask them about the death penalty. They are required to review all death sentences, a burdensome chore. Opponents of the death penalty have argued that all this extra attention is inefficient, and thus another reason to end capital punishment. They have a point, but such inefficiencies do have value. Forcing our state’s smartest and most powerful minds to examine the details of cases has brought to light any number of abuses of the system, and raised questions about the prisons themselves. And in the last few years, those questions have forced policymakers and voters to reconsider some criminal justice policies, particularly around sentencing. Would we now be reforming criminal justice without the spotlight provided by the machinery of death? There is another group of people who appreciate the death penalty’s value: those 700-plus Californians who sit on death row at San Quentin State Prison. Twice in the past decade, ballot initiatives asked California voters to end the death penalty. And in both campaigns, a significant number of death row prisoners took an improbable stand against the initiatives that would end their own death sentences. Even if the governor succeeds in creating a permanent ban, Californians will lose the scrutiny that the death penalty brings to criminal justice, and we seem unlikely to find some other mechanism to replace it. That’s not because they wanted to die. It’s because their death sentences conferred special resources that allowed them to fight their convictions. Only death row prisoners are guaranteed attorneys for appeals and federal court reviews of their trials. If the death penalty went away, death row inmates could become just 737 more forgotten lifers—with little hope of making it out of prison alive. California hasn’t executed anyone since 2006, when the state Supreme Court questioned the constitutionality of lethal injections. Which brings me to my own capital confession. This is not a popular opinion, but I would argue that for the last 13 years California has achieved the perfect death penalty equilibrium. Our state has capital punishment on the books, which provides the aforementioned accountability for the prisons and also represents the views of the millions of Californians who support the death penalty. But California no longer actually executes anyone, thus acknowledging the problems of state-sanctioned killing and eliminating the risk of murdering an innocent. In other words, we have had it both ways. Unfortunately, the governor’s moratorium, however well intentioned, disturbs that death penalty equilibrium. That has risks. Newsom’s effort could spark a legal and political backlash that forces the state to start executing people again. And even if the governor succeeds in creating a permanent ban, Californians will lose the scrutiny that the death penalty brings to criminal justice, and we seem unlikely to find some other mechanism to replace it. RIP, California death penalty. And thank you for your service.